Alicia Hawkins is Associate Professor of Archaeology in the School of the Environment at Laurentian University. She received her B.A., M.A. and Ph.D. from the University of Toronto. Her research interests include zooarchaeology, the Huron-Wendat past, Indigenous archaeology and archaeological survey methods. She has an on-going field program at the Wendat Ellery site. 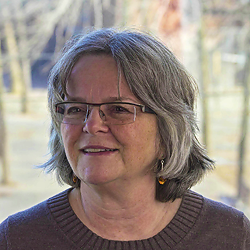 She has held a number of roles with the OAS since 2005, including board member, symposium program chair and Ontario Archaeology book review editor. She was a founding member of the Huronia chapter and occasionally directs public archaeology events for the chapter. Although originally from southern Ontario, she loves her adopted home of Sudbury where she can ski to work (in the winter). Jim is a currently the Manager of Planning and Business Development at Timmins Martelle Heritage Consultants Inc. and holds a professional archaeological license. He has been involved in Ontario archaeology since the late 1990s after taking a fieldschool at the Lawson Site, now Museum of Ontario Archaeology. Jim received his Hons. B.A. and M.A. from the University of Western Ontario with research focussed on the Late Woodland period. He spent the first years of his career working in the field of commercial archaeology before joining the Ministry of Tourism, Culture and Sport. During his 10 years with the provincial government Jim worked on both compliance enforcement as an Archaeology Reviewer Officer and Inspector under Part IV of the Ontario Heritage Act. In addition, he also in the development and implementation of policies specific to the practice of archaeology within the province. Jim's interest continues to focus on collaborative archaeology with Indigenous communities, archaeological echoes of shared territories, returning Ancestors to Indigenous communities, archaeological practice and policy development. Jim lives in Bayfield Ontario where he is an active member of his local community and can often be found at the hockey rink. Rob Pihl became Vice-President of the OAS in 2017 and has been a member since the mid-1970s when he was a graduate student in Anthropology at the University of Toronto (U of T); he has been a Life member for many years. Rob received a BA from Lawrence University, Appleton, Wisconsin, and a MA from the U of T. Rob has been a professional archaeologist in Cultural Resource Management since 1979, first working for the Museum of Indian Archaeology until 1983 (now the Museum of Ontario Archaeology), then with the firm of Mayer Pihl Poulton and Associates until 1988, and since then with Archaeological Services Inc (ASI). On September 30, 2016, Rob stepped down as Partner and Manager of the Environmental Assessment Division and started a new role with ASI as Senior Advisor; however, he recently decided to take a leave-of -absence from ASI and return to the U of T to complete an unfinished PhD degree that he started in 1976 that is focused on understanding the Middle Woodland ceramics of eastern Ontario and vicinity. Rob enjoys country-living in an 1860s farmhouse that is continuously under renovation, canoeing, travelling, and trying to keep up with six grandkids. Debbie Steiss is the Treasurer for the OAS. Debbie was a Partner and General Manager at ASI and has worked in Ontario Archaeology for over thirty years. She has a BA and MA in Anthropology from the University of Toronto. Prior to joining ASI, Debbie had participated in archaeological projects in the American Southwest, Canadian Arctic and southern Italy. When not working, you will likely find her on a tennis court. Kaitlyn Malleau currently works at Timmins Martelle as a Field and Lab Technician. She received her B.Sc. in Anthropology from Laurentian University, before going on to receive an M.A. in Anthropology from Western University. She has been passionate about Ontario archaeology ever since her field school experience on the Wendat Village site Ellery. For that reason, she chose an Ontario-based topic for her M.A. research, studying the variation of Genesee broad point form and use-wear across southern Ontario. Her research interests include lithic technology, experimental archaeology, and how communities of practice are reflected in material culture. When not doing archaeological work, Kaitlyn enjoys a good novel. Bill Ross holds a B.A. and an M.A. and has volunteered for the OAS since being a founding member of the Thunder Bay Chapter in 1979. He served on the Canadian Archaeological Association Board from 2011 to 2014 including two years as President, and served on the Association of Professional Archaeologists of Ontario Board from 2005 to 2011. He is the co-founder and has been co-chair of the Lake Superior Basin Archaeological Workshops over the past 34 years. Bill recently retired from Ross Archaeological Research, which he started in 2002, specializing in cultural resource management. Prior to consulting, he worked for the Ontario government for 25 years first as the Regional Archaeologist for North Central Ontario and then as Senior Archaeologist serving an area from the Upper Great Lakes to Hudson's Bay and from Quebec to Manitoba. He has authored or co-authored articles in Ontario Archaeology, The Wisconsin Archaeologist, Radiocarbon, The Journal of Archaeological Science, Geoarchaeology, and several other publications. Bill continues to conduct archaeological research in Northern Ontario as an avocation and is a Professional Associate with the Department of Anthropology, Lakehead University. James Conolly is Professor of Archaeology at Trent University, and also holds an Honorary Professorship at UCL's Institute of Archaeology in London, England. As an undergraduate at the University of Toronto he worked for Bob Burger over six summers as a field archaeologist (later field director) in the Toronto Region Conservation Authority. As well as several seasons at Seed-Barker, he participated in many pre-407 landscape surveys and excavations on conservation properties across north Toronto. He moved to the UK in the early 1990s and completed graduate degrees in geography and archaeology, focusing on the archaeology of early farming societies in SW Asia and the eastern Mediterranean. He held a lectureship at the Institute of Archaeology full time between 1997 until 2004, and participated and directed field surveys and excavations throughout Syria, Turkey and Greece. In 2004 he moved back to Canada to became Trent's first Canada Research Chair in Archaeology. In 2010 he was invited to help document and conserve a damaged ancient sacred site in the Kawarthas, the experience of which led him to shift his research and teaching interests to the Great Lakes region. James is now managing a SSHRC-funded field research project in the traditional territory of the Michi Saagig Anishinaabeg. The study is examining the chronology, subsistence, settlement, and social interaction networks of the complex hunter gatherers who inhabited the Kawartha Lakes and Rice Lake regions in deep antiquity. He is also interested in the archaeology of inundated (underwater) landscapes, lithic materials and tool making, and as well archaeological conservation and community-based programs. Amy St. John is currently a Ph.D. Candidate at Western University in the Department of Anthropology. Her research explores the use of innovative non-destructive micro computed tomography (CT) technology, at the Sustainable Archaeology facility at Western University, to examine the craft of indigenous ceramic manufacture. She received a B.A. in combined Honours Classical Archaeology and Honours English at Wilfrid Laurier University in 2007, where she fell in love with archaeological fieldwork. She completed her M.A. in Archaeology at Memorial University of Newfoundland in 2011, focused on interpreting ceramics from a historic migratory French Fishery site. Between 2011 and 2013 Amy worked in field and lab settings with Cultural Resources Management firms in southeastern Ontario. She is interested in preserving and interpreting the material culture of Ontario (with a focus on ceramics research and material science) to further understandings of past cultural traditions and ways of life. When not working on her dissertation, Amy enjoys gardening and equestrian activities. Dana Millson received her B.A. (Hons) in Anthropology at University of Waterloo in 2004 and then read for an M.A. in Archaeology at Memorial University of Newfoundland and a PhD at Durham University (UK), which she completed in 2013. She is a materials specialist, with a concentration in ceramics, who has worked in Great Britain, Nunavut, and Ontario. Her research interests include ceramic technology, methods of ceramic analysis, palaeodiet, experimental archaeology, archaeological theory and public archaeology. Dana has been Director of Membership for the OAS since 2014 and currently teaches undergraduate courses at Wilfrid Laurier University. She is fascinated by the history of this province and is a strong supporter of preserving and promoting knowledge of Ontario’s rich cultural heritage.